OK, time for a bit of a history lesson. 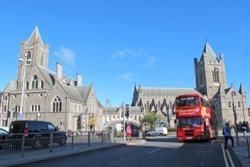 If you’re looking for further confirmation that Dublin is pretty special, here’s proof on a grand scale - within a few minutes’ walk of each other lie the city’s two Protestant Church of Ireland cathedrals - Christ Church Cathedral and St Patrick’s Cathedral (in order of seniority). 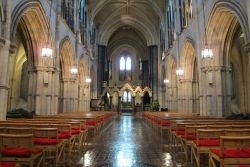 Over the centuries that followed, the two acted in concert as co-cathedrals, and their individual status was further clarified when they were designated as the Diocesan Cathedral for Dublin and Glendalough and Metropolitan Cathedral for the Southern Province of the Church of Ireland (Christ Church) and the National Cathedral of the Church of Ireland (St Patrick’s) respectively within the United Dioceses of Dublin and Glendalough. 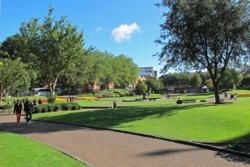 Built in honour of Ireland’s patron saint, St Patrick’s Cathedral is next to a park containing the famous well where - tradition has it - Saint Patrick baptised converts on his visit to Dublin. Even though it’s the ‘junior’ cathedral, it’s been here for over 800 years. The parish church on this site was granted collegiate status in 1191, and raised to cathedral status in 1224. 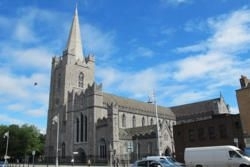 The largest cathedral in Ireland, the building as it now stands dates from 1220. During 800+ years, some historical heavy hitters have visited - Oliver Cromwell, William of Orange, King James I and Queen Victoria (with Prince Albert, naturally) among them. It’s also the final resting place of Jonathan Swift, author of Gulliver’s Travels and Dean (head of the Cathedral) from 1713 to 1745. Fast-forwarding to today, St Patrick's Cathedral has provided QR codes all around the building, allowing visitors with smart phones to quickly access relevant content on the Cathedral’s website without having to search for it. 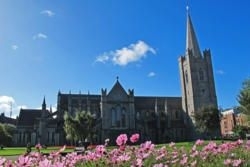 If you’re a stickler for technicalities, Christ Church Cathedral (founded c. 1028) is Dublin's only ‘real’ cathedral as St Patrick’s lacks a bishop. And if you’re that pedantic, in the interests of accuracy it’s also rarely referred to by its ‘proper’ name - the Cathedral of the Holy Trinity. King Sitric (the first Christianised Danish monarch), built a wooden church at this site in 1038. 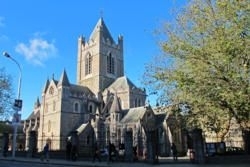 The present stone Cathedral was begun in 1172 after Norman baron Strongbow’s conquest of Dublin, with construction continuing well into the 13th century. As a result, a transition from Norman to Early English Gothic styles is reflected in the architecture. The Cathedral was heavily restored from 1871-78 - typical of many Victorian renovations, the work was important for preservation but removed a good deal of the original medieval character (the exterior was completely refaced and the interior was fully redone in a Victorian Neo-Gothic style). Want to make some joyful noise? Christ Church offers the chance to ring the cathedral bells (under expert supervision) during a guided tour of the tower. If you’re more experienced and fancy a chance to take your passion for campanology on the road, the Christ Church Cathedral Society of Change Ringers invites ringers worldwide to join in service ringing and practice sessions. 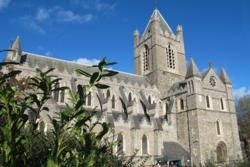 It’s always advisable to make contact beforehand (phone +353 (0)86 827 9631 or contact ringingmaster@cccdub.ie).